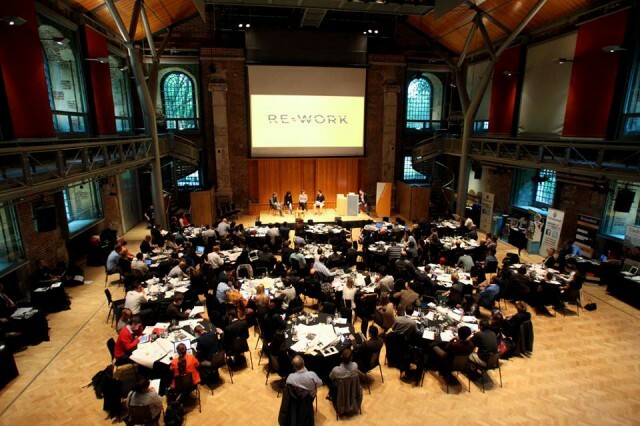 Re.Work Conference organized its first event ‘Re.Work Tech’ in London on the 19th September 2013, bridging the gap between academia, business and entrepreneurs. From self-assembling components to public architecture, the event had the ambition to boost bracing in the future of technology. Knowtex’s reporter Elise Nardin was there and interviewed Nikita Johnson, founder of Re.Work events. I met Nikita Johnson before Twitter existed. We met on exchange at the University of British Columbia, Canada. Nikita was an undergrad in geography, I was graduating in sociology. That was 7 years ago. Fast-forward to July 2012. Sitting in a cafe in Berlin, I’m catching up with her. She has decided to follow her family’s footsteps and become an entrepreneur herself. She is going to start a series of events around new technologies wanting to bridge the gap between research, business and startup. Who else better than Nikita Johnson to tell us what Re.WORK is about? Fast-forward to Thursday September 19th. After over a year and a half of hard work and sleepless nights, here it is: It’s registration time at Re.Work Tech. 200 attendees coming from Germany, Switzerland, France, the UK, Romania, and the US. 39 speakers and moderators touched on 3 general topics divided into 10 sessions. An intense one-day conference. Here is a recap of the main trends discussed. To kick-off the event, the Google Solve for <x> team facilitated a session to think of new ways of looking at technology and where new opportunities may lay. Bruce Schlee, Rachel Armstrong and Skylar Tibbits presented various results in intelligent robotics, synthetic soils, and self-assembling smarter materials. Attendees separated in groups of 6 to look into one of the technologies that struck them most and discuss its potential, as well as point out its impacts, and risks. Three main directions emerged from the reflexions. Several speakers pointed out the urgent need to collaboratively define our values, needing to ‘redefine our socio-technical literacies’. It is everyone’s responsibility to engage with technology, from policy makers to educators, kids to parents, by changing the way we look at it and apply it on a daily basis. Technology has a tremendous potential to surprise us and work out lasting solutions for deeply rooted problems. The only limits are our own paradigms and our fear of freeing our imagination. DUS Architects believes in public architecture, which is portrayed in the ‘Kamer Maker’ public 3D building printing project in the Netherlands. Like smarter components that self-assemble organically, technology has the potential to lead us to unknown territories. We need to be more intuitive about the way we regard technology and accept to loosen our grip. Rachel Armstrong‘s approach for instance is that of synthetic soils and how nature already provides innovative solutions if we take a closer look at it. Innovation comes out of labs, community-based labs, and people’s garages or kitchens. Some will end up in the trash, some may revolutionize a field. The mindset has changed, and it’s no longer much about structured, controlled innovation, but rather ‘trial-and-error’, local innovation that answers everyone’s unique needs. A marathon-like conference, speakers and break-out sessions followed each other without interruption. With so many sessions and the wide array of topics, Re.Work Tech could maybe spill its schedule over two days, rather than maximizing the one-day format. The sitting format provided opportunity for conversation, while the Google Solve for <x> session enabled attendees to ‘re-work’ the concepts and ideas presented beforehand, with a hands-on approach. The event series don’t only want to gather people around certain topics such as technology, cities, or design, but want to build an offline community that meets in-between events. Nikita Johnson partnered with General Assembly London to organize a prototyping workshop, and collaborated with Nesta for a one-day brainstorm session right after Re.Work Tech, which was moderated by Joel Gethin Lewis, an inspired artist who works at the cross-roads of art, technology and design. Rooting the cross-discipline approach of the event into a continuum of workshops and capsule events is a component that is not common for most conferences. The fact that RE-WORK Tech is relatively small in terms of the number of attendees is interesting for people who want to make the most out of an event. On a final note, a lot of technology-oriented conferences have a hard time evening out gender representation on stage and off-stage. Despite its large portion of male attendees and speakers, the general impression was not of your typical tech event. Maybe the reason for this diverse audience lies in the core concept of the event wanting to make various fields meet. This should be further increased in the upcomming events, such as the next one about cities: Re.Work Cities taking place on December 13th in London. Before heading back to Switzerland, I managed to swing by the Southbank Center, which was taking part to the London Design Festival. What struck me most was ‘The Fifth Element – The Future of Design‘ exhibition which featured 39 installations and work of several ‘designists’ who ‘look to current thought in the sciences, technology, new materials and nature when they create.’ Topics such as synthetic soils, wet buildings, and self-assembling components were echoed in these design prototypes. With its hands-on approach, the re-work event series has grasped the potential of cross-disciplines and T-shape perspective of looking at current issues. The future (of technology) is right here, and right now: here’s Fatboy Slim’s 1999 ‘Right Here, Right Now’ to send you off.